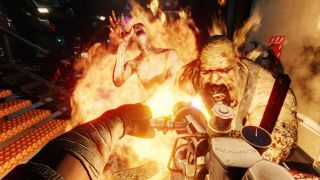 At our very own PC Gaming Show t'other week, Tripwire showed off some of the new content coming to their corpse dismemberment simulator, Killing Floor 2. You've already seen it in action (video of that above), but the devs have now helpfully detailed a few of the contents of their upcoming 'Incinerate 'N Detonate' pack. You can probably see why you'd want to evacuate it: it's a right mess. You might also want to get out because of the two new perks coming to the Early Access game's way: Firebug and Demolitions. Annoyingly, the devs stop short of revealing the entire contents of Incinerate 'N Detonate, but they do say that it will add another 50% of content to the Early Access game.